For the bridge in Sacramento, California, see Tower Bridge (California). For the station in Co. Cork, Ireland, see Tower Bridge railway station. Tower Bridge is a combined bascule and suspension bridge in London, built between 1886 and 1894. The bridge crosses the River Thames close to the Tower of London and has become an iconic symbol of London. Because of this, Tower Bridge is sometimes confused with London Bridge, situated some 0.5 mi (0.80 km) upstream. Tower Bridge is one of five London bridges now owned and maintained by the Bridge House Estates, a charitable trust overseen by the City of London Corporation. It is the only one of the Trust's bridges not to connect the City of London directly to the Southwark bank, as its northern landfall is in Tower Hamlets. The bridge consists of two bridge towers tied together at the upper level by two horizontal walkways, designed to withstand the horizontal tension forces exerted by the suspended sections of the bridge on the landward sides of the towers. The vertical components of the forces in the suspended sections and the vertical reactions of the two walkways are carried by the two robust towers. The bascule pivots and operating machinery are housed in the base of each tower. Before its restoration in the 2010s, the bridge's colour scheme dated from 1977, when it was painted red, white and blue for Queen Elizabeth II's Silver Jubilee. Its colours were subsequently restored to blue and white. The bridge deck is freely accessible to both vehicles and pedestrians, whereas the bridge's twin towers, high-level walkways and Victorian engine rooms form part of the Tower Bridge Exhibition, for which an admission charge is made. The nearest London Underground tube stations are Tower Hill on the Circle and District lines, London Bridge on the Jubilee and Northern lines and Bermondsey on the Jubilee line, and the nearest Docklands Light Railway station is Tower Gateway. The nearest National Rail stations are at Fenchurch Street and London Bridge. In the second half of the 19th century, an advertisement in the East End of London led to a hiring for a new river crossing downstream of London Bridge. A traditional fixed bridge at street level could not be built because it would cut off access by sailing ships to the port facilities in the Pool of London, between London Bridge and the Tower of London. A Special Bridge or Subway Committee was formed in 1877, chaired by Sir Albert Joseph Altman, to find a solution to the river crossing problem. Over 50 designs were submitted, including one from civil engineer Sir Joseph Bazalgette. 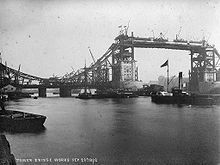 Bazalgette's design was rejected because of a lack of sufficient headroom, and design was not approved until 1884, when it was decided to build a bascule bridge. Sir John Wolfe Barry was appointed engineer with Sir Horace Jones as architect (who was also one of the judges). An Act of Parliament was passed in 1885 authorising the bridge's construction. It specified the opening span must give a clear width of 200 feet (61 m) and a headroom of 135 feet (41 m). Construction had to be in a Gothic style. Barry designed a bascule bridge with two bridge towers built on piers. The central span was split into two equal bascules or leaves, which could be raised to allow river traffic to pass. The two side-spans were suspension bridges, with the suspension rods anchored both at the abutments and through rods contained within the bridge's upper walkways. Construction started in 1886 and took eight years with five major contractors – Sir John Jackson (foundations), Baron Armstrong (hydraulics), William Webster, Sir H.H. Bartlett, and Sir William Arrol & Co. – and employed 432 construction workers. E W Crutwell was the resident engineer for the construction. Jones died in 1886 and George D. Stevenson took over the project. Stevenson replaced Jones's original brick façade with the more ornate Victorian Gothic style, which makes the bridge a distinctive landmark, and was intended to harmonise the bridge with the nearby Tower of London. The total cost of construction was £1,184,000 (equivalent to £132 million in 2018). The bridge was officially opened on 30 June 1894 by the then Prince of Wales (the future King Edward VII), and his wife, The Princess of Wales (Alexandra of Denmark). The bridge connected Iron Gate, on the north bank of the river, with Horselydown Lane, on the south – now known as Tower Bridge Approach and Tower Bridge Road, respectively. Until the bridge was opened, the Tower Subway – 400 m to the west – was the shortest way to cross the river from Tower Hill to Tooley Street in Southwark. Opened in 1870, Tower Subway was among the world's earliest underground ("tube") railways, but it closed after just three months and was re-opened as a pedestrian foot tunnel. Once Tower Bridge was open, the majority of foot traffic transferred to using the bridge, there being no toll to pay to use it. Having lost most of its income, the tunnel was closed in 1898. The high-level open air walkways between the towers gained an unpleasant reputation as a haunt for prostitutes and pickpockets; as they were only accessible by stairs they were seldom used by regular pedestrians, and were closed in 1910. The walkway reopened in 1982. During the Second World War and as a precaution against the existing engines being damaged by enemy action, a third engine was installed in 1942: a 150 hp horizontal cross-compound engine, built by Vickers Armstrong Ltd. at their Elswick works in Newcastle upon Tyne. It was fitted with a flywheel having a 9-foot (2.7 m) diameter and weighing 9 tons, and was governed to a speed of 30 rpm. The engine became redundant when the rest of the system was modernised in 1974, and was donated to the Forncett Industrial Steam Museum by the Corporation of the City of London. In 1974, the original operating mechanism was largely replaced by a new electro-hydraulic drive system, designed by BHA Cromwell House, with the original final pinions driven by modern hydraulic motors and. In 1982, the Tower Bridge Exhibition opened, housed in the bridge's twin towers, the long-closed high-level walkways and the Victorian engine rooms. The latter still house the original steam engines and some of the original hydraulic machinery. 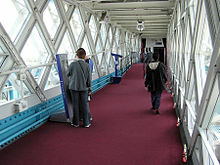 The renovation of the walkway interior was completed in mid-2009. Within the walkways a versatile new lighting system has been installed, designed by Eleni Shiarlis, for when the walkways are in use for exhibitions or functions. The new system provides for both feature and atmospheric lighting, the latter using bespoke RGB LED luminaires, designed to be concealed within the bridge superstructure and fixed without the need for drilling (these requirements as a result of the bridge's Grade I status). On 8 July 2012, the west walkway was transformed into a 200-foot-long (61 m) Live Music Sculpture by the British composer Samuel Bordoli. 30 classical musicians were arranged along the length of the bridge 138 feet (42 m) above the Thames behind the Olympic rings. The sound travelled backwards and forwards along the walkway, echoing the structure of the bridge. During this time the bridge was still open to water borne traffic as required by Act of Parliament. The bridge was open to pedestrians for all but three weekends, where a free ferry service was in operation. The bridge is 800 feet (240 m) in length with two towers each 213 feet (65 m) high, built on piers. The central span of 200 feet (61 m) between the towers is split into two equal bascules or leaves, which can be raised to an angle of 86 degrees to allow river traffic to pass. The bascules, weighing over 1,000 tons each, are counterbalanced to minimise the force required and allow raising in five minutes. The main bridge deck carries two lanes of road traffic between two low-level pedestrian walkways across both suspension spans and the opening bascule section of the bridge, with the walkways separated from the roadway by fences. The roadway passes through each of the two towers, whereas the low-level walkways pass around the outside of the towers. One of the chimneys on the bridge, which are often mistaken for lamp posts, connects up to an old fireplace in a guardroom of the Tower of London. It is long-disused. 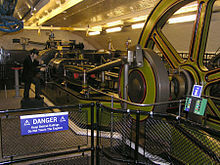 The original raising mechanism was powered by pressurised water stored in several hydraulic accumulators. The system was designed and installed by Hamilton Owen Rendel while working for Sir W. G. Armstrong Mitchell & Company of Newcastle upon Tyne. Water, at a pressure of 750 psi (5.2 MPa), was pumped into the accumulators by two 360 hp (270 kW) horizontal twin-tandem compound stationary steam engines, fitted with Meyer expansion slide valves. Each engine drove a force pump from its piston tail rod. The accumulators each comprise a 20-inch (51 cm) ram on which sits a very heavy weight to maintain the desired pressure. Vessels passing through the bridge had to display signals too: by day, a black ball at least 2 feet (0.61 m) in diameter was to be mounted high up where it could be seen; by night, two red lights in the same position. Foggy weather required repeated blasts from the ship's steam whistle. If a black ball was suspended from the middle of each walkway (or a red light at night) this indicated that the bridge could not be opened. These signals were repeated about 1,000 yards (910 m) downstream, at Cherry Garden Pier, where boats needing to pass through the bridge had to hoist their signals/lights and sound their horn, as appropriate, to alert the Bridge Master. To maintain the integrity of the structure, the City of London Corporation has imposed a 20-mile-per-hour (32 km/h) speed restriction, and an 18-tonne (20-short-ton) weight limit on vehicles using the bridge. A camera system measures the speed of traffic crossing the bridge, using a number plate recognition system to send fixed penalty charges to speeding drivers. The bascules are raised around 1000 times a year. River traffic is now much reduced, but it still takes priority over road traffic. Today, 24 hours' notice is required before opening the bridge, and opening times are published in advance on the bridge's website. There is no charge for vessels to open the bridge. The Tower Bridge Exhibition is a display housed in the bridge's twin towers, the high-level walkways and the Victorian engine rooms. It uses films, photos and interactive displays to explain why and how Tower Bridge was built. Visitors can access the original steam engines that once powered the bridge bascules, housed in a building close to the south end of the bridge. The exhibition charges an admission fee. Entrance is from the west side of the bridge deck to the northern tower, from where visitors ascend to level 4 by lift before crossing the high-level walkways to the southern tower. In the towers and walkways is an exhibition on the history of the bridge. The walkways also provide views over the city, the Tower of London and the Pool of London, and include a glass-floored section. From the south tower, visitors can visit the engine rooms, with the original steam engines, which are situated in a separate building beside the southern approach to the bridge. Although Tower Bridge is an undoubted landmark, professional commentators in the early 20th century were critical of its aesthetics. "It represents the vice of tawdriness and pretentiousness, and of falsification of the actual facts of the structure", wrote Henry Heathcote Statham, while Frank Brangwyn stated that "A more absurd structure than the Tower Bridge was never thrown across a strategic river". Benjamin Crisler, the New York Times film critic, wrote in 1938: "Three unique and valuable institutions the British have that we in America have not: Magna Carta, the Tower Bridge and Alfred Hitchcock." Architectural historian Dan Cruickshank selected Tower Bridge as one of his four choices for the 2002 BBC television documentary series Britain's Best Buildings. Tower Bridge is often mistaken for London Bridge, the next bridge upstream. A popular urban legend is that in 1968, Robert P. McCulloch, the purchaser of the old London Bridge that was later shipped to Lake Havasu City in Arizona, believed that he was in fact buying Tower Bridge. This was denied by McCulloch himself and has been debunked by Ivan Luckin, the vendor of the bridge. A partial replica of Tower Bridge has been built in the city of Suzhou in China. The replica differs from the original in having no lifting mechanism and having four separate towers. On 10 August 1912 Francis McClean flew between the bascules and the high-level walkways in his Short Brothers S.33 floatplane. In December 1952, the bridge opened while a number 78 double-decker bus was crossing from the south bank. At that time, the gateman would ring a warning bell and close the gates when the bridge was clear before the watchman ordered the raising of the bridge. The process failed while a relief watchman was on duty. The bus was near the edge of the south bascule when it started to rise; driver Albert Gunter made a split-second decision to accelerate, clearing a 3-foot (0.91 m) gap to drop 6 feet (1.8 m) onto the north bascule, which had not yet started to rise. There were no serious injuries. Gunter was given £10 (equivalent to £280 in 2018) by the City Corporation to honour his act of bravery. In the summer of 1973, a single-engined Beagle Pup was twice flown under the pedestrian walkway of Tower Bridge by 29-year-old stockbroker's clerk Paul Martin. Martin was on bail following accusations of stockmarket fraud. He then "buzzed" buildings in The City, before flying north towards the Lake District where he died when his aircraft crashed some two hours later. In May 1997, the motorcade of United States President Bill Clinton was divided by the opening of the bridge. The Thames sailing barge Gladys, on her way to a gathering at St Katharine Docks, arrived on schedule and the bridge was opened for her. Returning from a Thames-side lunch at Le Pont de la Tour restaurant with UK Prime Minister Tony Blair, President Clinton was less punctual and arrived just as the bridge was rising. The bridge opening split the motorcade in two, much to the consternation of security staff. A spokesman for Tower Bridge is quoted as saying: "We tried to contact the American Embassy, but they wouldn't answer the phone." Before dawn on 31 October 2003, David Crick, a Fathers 4 Justice campaigner, climbed a 100-foot (30 m) tower crane near Tower Bridge at the start of a six-day protest dressed as Spider-Man. Fearing for his safety, and that of motorists should he fall, police cordoned off the area, closing the bridge and surrounding roads and causing widespread traffic congestion across the City and east London. The Metropolitan Police were later criticised for maintaining the closure for five days when this was not strictly necessary in the eyes of some citizens. On 11 May 2009, six people were trapped and injured after a lift fell 10 feet (3 m) inside the north tower. ^ a b "Tower Bridge restored to true colours | Tower Bridge". www.thetowerbridge.info. Retrieved 8 February 2017. ^ a b "Finishing touches to Tower Bridge | Tower Bridge". www.thetowerbridge.info. Retrieved 8 February 2017. ^ "Tower Bridge Exhibition website". Corporation of The City of London. Archived from the original on 12 November 2010. Retrieved 18 November 2010. ^ a b c Weinreb et al. 2008, p. 922. ^ a b c d e f g "Tower Bridge". Archive – the Quarterly Journal for British Industrial and Transport History. Lightmoor Press (3): 47. 1994. ISSN 1352-7991. ^ Smith, Denis (2001). Civil Engineering Heritage: London and the Thames Valley. Thomas Telford. pp. 22–23. ISBN 0-7277-2876-8. ^ a b "Tower Bridge: fascinating facts and figures". The Telegraph. 8 January 2018. ^ "The Tower Bridge Engine". Forncett Industrial Steam Museum. Archived from the original on 25 February 2010. Retrieved 27 February 2007. ^ a b "The Firm: BHA Cromwell House". G. M. Beresford Hartwell. Retrieved 30 June 2015. ^ a b Hartwell, Geoffrey. "Tower Bridge, London". Archived from the original on 8 December 2013. Retrieved 27 February 2007. ^ a b "About Us". Tower Bridge Exhibition. Retrieved 14 July 2015. 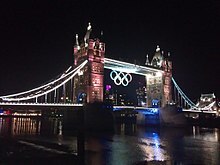 ^ Olympics rings Tower over London, Daily Mail (London), accessed 29 July 2012. ^ "Tower Bridge is London's Latest Venue – Classic FM Music News and Features". Classicfm.com. Retrieved 28 May 2013. ^ Topping, Alexandra (13 August 2012). "London 2012: let the Paralympics preparations begin". The Guardian. London. Retrieved 18 August 2012. 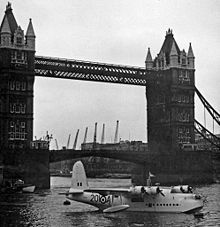 ^ "Tower Bridge closure". Transport for London. Archived from the original on 11 October 2016. ^ "11 Secret Features Of Famous London Landmarks". Londonist. 20 October 2015. ^ "Bridge History". Towerbridge.org.uk. 1 February 2003. Archived from the original on 20 June 2012. Retrieved 13 June 2012. ^ Lane, MR (1989). The Rendel Connection: a dynasty of engineers. Quiller press, London. ISBN 1-870948-01-7. ^ "History William Sugg & Co Westminster gas lighting cooking heating appliance manufacturer". ^ "Bridge Lifts". Tower Bridge Official Website. Archived from the original on 12 September 2007. Retrieved 25 September 2007. ^ "Bridge Lift Times". Tower Bridge Exhibition. City of London. Retrieved 10 November 2014. ^ "Step Inside". Tower Bridge Exhibition. Retrieved 14 July 2015. ^ Crisler, B. R. (12 June 1938). "Hitchcock: Master Melodramatist". The New York Times. ^ Cruickshank, Dan. "Choosing Britain's Best Buildings". BBC History. Archived from the original on 13 May 2007. Retrieved 3 June 2008. ^ Jason Cochran, Pauline Frommer (2007). Pauline Frommer's London. Frommer's. p. 184. ISBN 978-0-470-05228-0. Retrieved 9 July 2011. ^ Silk, Michael; Manley, Andrew (3 June 2014). "From Tower Bridge to Sydney Harbour, welcome to China's city of clones". The Guardian. Retrieved 14 July 2015. ^ "The Jumping Bus". Time. 12 January 1953. Archived from the original on 22 December 2008. ^ Car Journals. "Mind The Gap When Jumping Over Tower Bridge". Car Journals. Retrieved 20 June 2014. ^ Shore, John (July 1997). "Gladys takes the rise out of Bill". Regatta Online. Retrieved 25 September 2007. ^ "'Spiderman' cleared over protest". BBC News. 14 May 2004. Retrieved 31 October 2008. Weinreb, Ben; Hibbert, Christopher; Keay, John; Keay, Julia (2008). The London Encyclopaedia (2nd ed.). Pan Macmillan. ISBN 978-1-405-04924-5. Wikimedia Commons has media related to Tower Bridge.